Gen and Kelly Tanabe are the founders of SuperCollege and the award-winning authors of 13 books on college admission, financial aid and scholarships. Together they were accepted to all of the Ivy League colleges and won more than $100,000 in merit-based scholarships to graduate from Harvard debt-free. They tour nationally speaking about college planning and have served as expert sources for USA Today, the New York Times, CNN, and U.S. News & World Report. Visit Gen and Kelly Tanabe in the Expert Advice section to get your questions answered. You will find everything you need to prepare successful admission essays in this book. 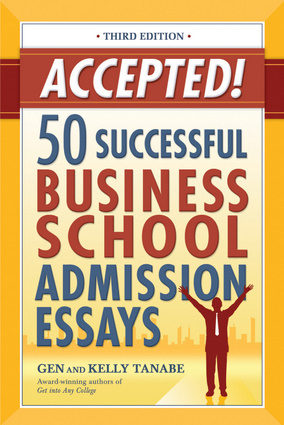 Containing 50 real essays students have written to gain admission to top business schools, this guide details the strengths of each essay, the inspiration of the student who wrote it and what makes it a winner. The essays represent a diverse group of students and include those with traditional consulting and business backgrounds, as well as those with nontraditional backgrounds in areas such as public service, the military and culinary arts. Crucial insights are included from business school admission officers who reveal what they are looking for in applicants, and successful applicants describe what worked for them and the mistakes they made that future applicants should avoid. Also included are strategies for the entire admission process, such as how to research the type of students that each school is seeking, ace the interview and get powerful recommendations. 7. Essays: Why Do You Want an MBA? 8. Essays: Why Attend This Particular School? 9. Essays: What Do You Offer? "The book is filled with student-tested strategies to help applicants write better essays that stand out from the pile." "Helpful, well-organized guide, with copies of actual letters and essays and practical tips." "Upbeat tone and clear, practical advice." "The Tanabes literally wrote the book on the topic." "The first book to feature the strategies and stories of real students."